Family, friends, donors and coworkers celebrate physician’s commitment and spirit of giving. Brittany Hudlin and Carol Hudlin. Gilberto Estrada and Jose Aguilar. Dr. Christopher Hudlin, a general surgeon who joined Gould Medical Group in 2007, passed away in 2016. Last Friday, over 100 Sutter Gould Medical Foundation (SGMF) staff, Gould Medical Group physicians, donors and friends joined Dr. Hudlin’s family in honoring him with the dedication of a bench at the Stockton Medical Plaza on Hammer Lane in Stockton. At the conclusion of the dedication ceremony, SGMF’s Katrina Holmes (Regional Director Gould Ambulatory Surgery Centers), a family friend and colleague of Dr. Hudlin, announced the recipients of the first annual scholarship from Health Careers Academy. “Opportunities to contribute to the scholarship in Dr. Hudlin’s name will help continue the vision he had for supporting our future healthcare leaders,” said Holmes. 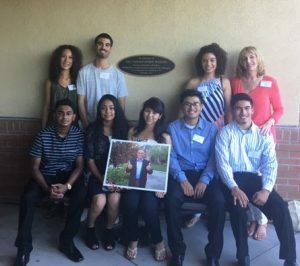 For more information on how you can contribute to the Dr. Christopher Hudlin Endowment fund, visit http://www.suttergould.org/giving/ or contact Lisa Hume by calling 209-530-3777 or via email at Humelk@Sutterhealth.org.